Browse the official website of the Apostolic Visit of Pope Francis to the Philippines at PapalVisit.ph launched by the Catholic Bishops’ Conference of the Philippines (CBCP). The website will have the latest news and updates on the pope’s visit and will be the main resource for catechesis, official prayers, songs and liturgy guides. 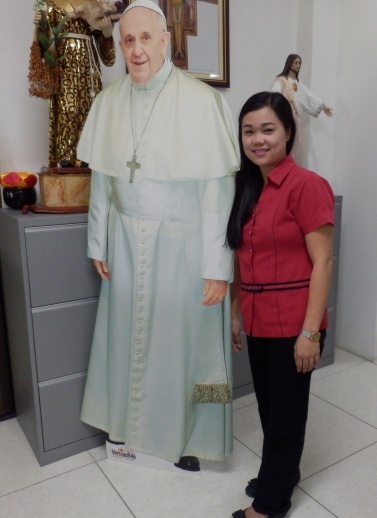 You can also see Pope Francis’ life size cardboard cutout picture at the parish office. This was distributed by Radio Veritas to generate “papal fever” among selfie-loving Filipinos before the pope’s visit in January.